Just over five years ago, on 30 June 2004, the Cassini orbiter and the Huygens probe it was delivering to Titan went into orbit around Saturn and began detailed exploration of the Saturnian system. Over this time more and more of the surface of Saturn's moon Titan has been covered by the suite of complementary instruments, and as we learn more Titan becomes increasingly intriguing. 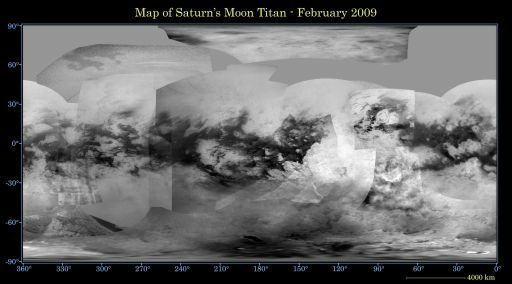 Map of Titan's surface created from images acquired by Cassini's Imaging Science Subsystem (ISS) through February 2009 at a wavelength of 938 nm. 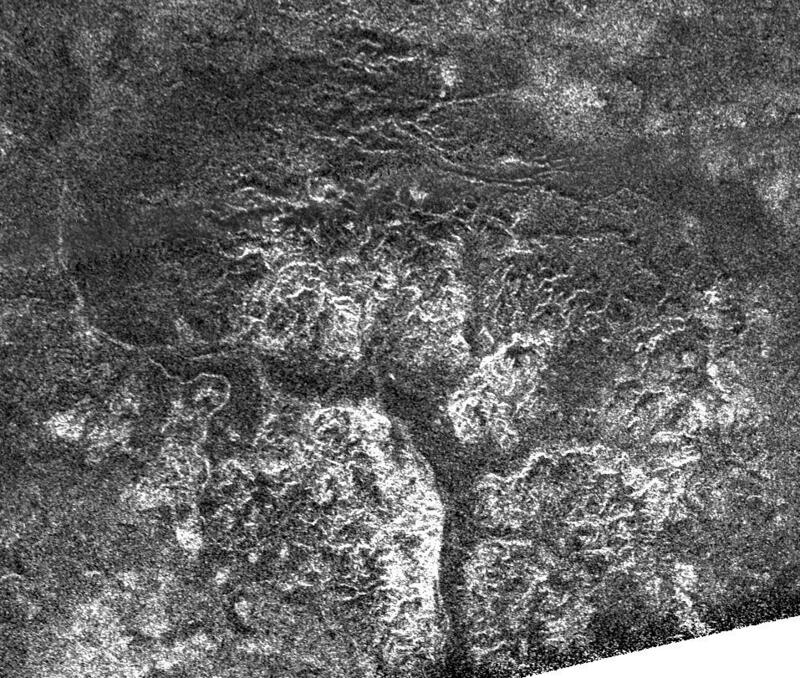 Cassini synthetic aperture radar (SAR) image of an intricate system of valleys carved by rivers of liquid methane. 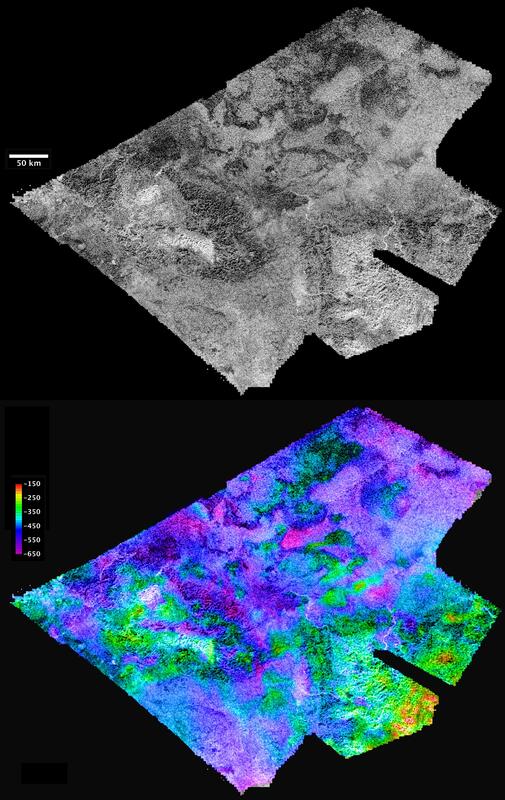 SAR image and topography from a stereo-pair of SAR images acquired by Cassini's RADAR instrument of Hotei Arcus, an area that is hypothesized to have been the site of cryovolcanic eruptions. 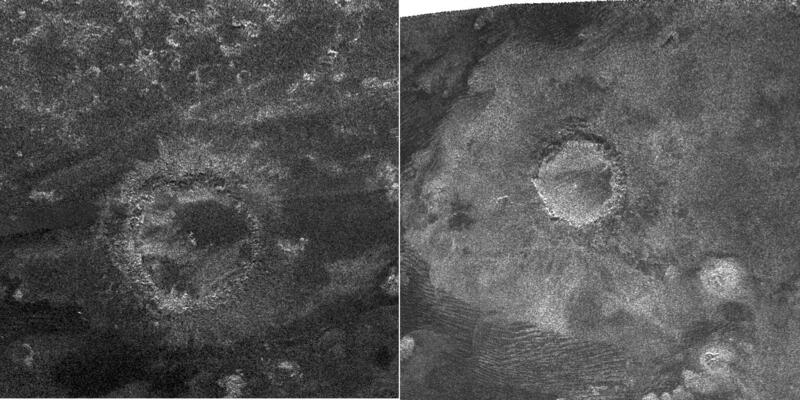 Impact craters and tectonic features, which are generally quite common on other icy satellites, have been harder to identify on Titan, likely, as on Earth, a result of modification by erosional processes. SAR images of impact craters, 112 km (left) and 80 km (right) in diameter. On Earth, which has similar complexity in terms of geologic processes overprinting one another, we usually have the luxury of being able to explore geological structures of unknown origin in person. Even in cases where structures are not directly accessible, e.g. the Chicxulub crater buried deep within Mexico's Yucatan Peninsula, we can acquire samples via drilling and structural information through techniques such as seismic surveys. 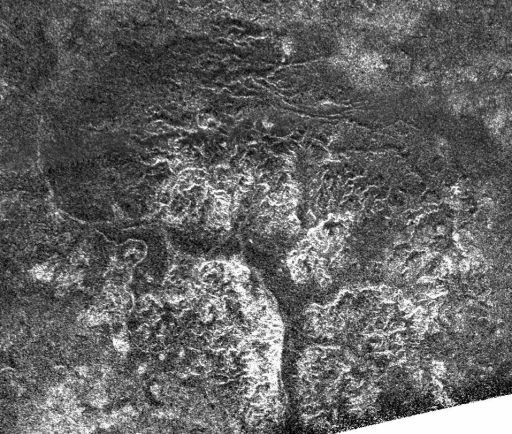 On Titan by comparison, for now at least, we are much more restricted: the Huygens probe revealed Titan's surface in great detail at a single location, and Titan's atmosphere not only obscures the surface but also limits the altitudes of Cassini's closest approaches to just under a thousand kilometers. 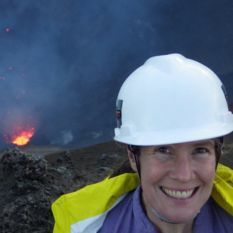 Unraveling Titan's complicated geologic history is quite a challenge, but it is precisely this complexity that makes the exploration of Titan so exciting.